DEBORAH CROMBIE: Welcome back, Lisa Alber! I love that JUNGLE RED has a special place in your writing history, and we are always thrilled to have you! But I do want to know how time--and books!--go by so fast... Has it really been four years? LISA ALBER: Thanks for inviting me today, Debs! A funny thing happened on the way to writing this blog post. I decided to refresh my memory about my previous guest posts here on Jungle Reds and came upon a post that I’d forgotten I’d written. My very first guest post anywhere, as a matter of fact, back in 2013. It’s a post about Coffee Toffee Pie (+recipe!) and my deceased dad—a kind of loaded topic. Not the pie, which was the reason Lucy asked me to post in the first place (everyone loves pie, am I right or am I wrong? ), but the dad bits. Fast forward four years, and I can’t help but think about how father-daughter (and some son) relationships figure big in my novels. It’s a theme I keep mining, keep wanting to explore. 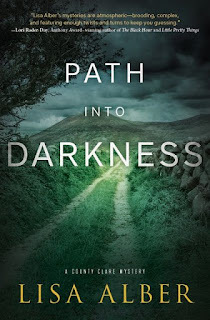 In Path Into Darkness, my third novel set in Ireland, one of my two main series characters, DS Danny Ahern, balances being a single father, managing his comatose wife’s medical ups-and-downs, and investigating the murder of one of his pub mates, Elder Joe. Meanwhile, my other protagonist, Californian Merrit, is still trying to maneuver around her relationship with her father, Liam, at the same time she gets pulled into Danny’s investigation. So, fathers and their children—the theme that keeps on giving! I’ve been thinking about my dad a lot lately because I visited with his sisters in Chicago at the beginning of the month. I hadn’t seen them in decades. 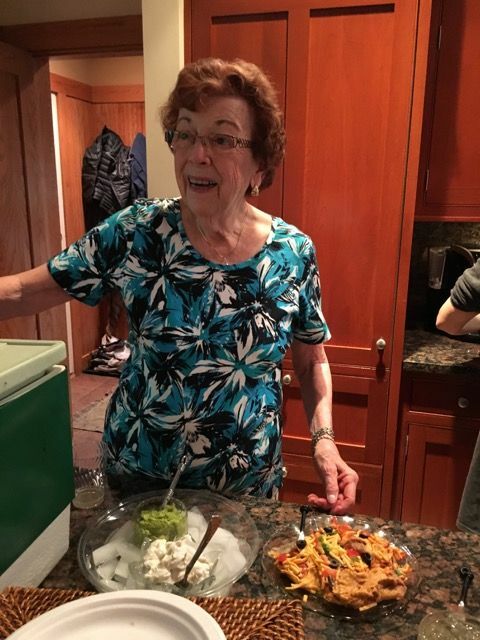 At one point, Aunt Bernie was preparing appetizers while I drank wine (what’s new? ), and I had this moment of dislocation. Her mannerisms, her gestures, her expressions, even the way her mouth hung open when she wasn’t talking, was my dad all over again. For a few moments there, Dad was alive again. And that was so dad too—using logic to veer away from emotion. I just had to laugh, but I didn’t let her Alber-ness daunt me. I was feeling emotional, and I was going to express it! “Well, that’s OK then,” she said, which makes me smile even now. So effusive, we Albers! It might be a truism that our themes pick us rather than the other way around. If that’s so, I wonder when I’m going to start delving into mother-child dynamics? I can echo all that and add that I LOVED PATH INTO DARKNESS and so did my mystery fan daughter. Lisa Alber’s debut novel, Kilmoon, was nominated for the Rosebud Award of Best First Novel. 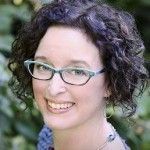 Kirkus calls her second novel, Whispers in the Mist, a “worthy successor to Kilmoon in tone, mood, complexity, and keen insight into human failures and triumphs.” She balances writing her next novel with gardening, dog-walking, and goofing off. She lives in Portland, OR. You can find Lisa online at lisaalber.com, Facebook and Twitter. 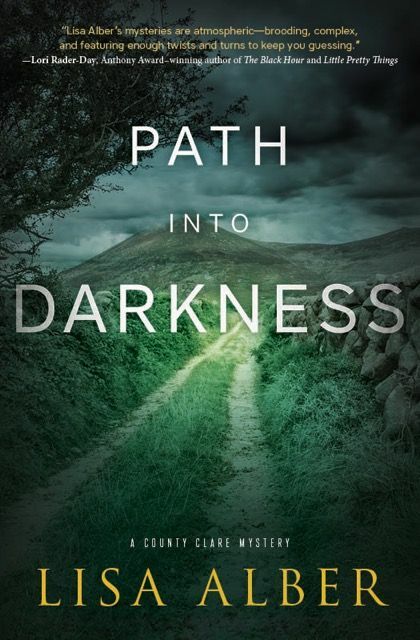 Lisa will be dropping in to chat, and will give away a copy of PATH INTO DARKNESS AND an Irish trinket to a lucky commenter. READERS, do you enjoy books that explore complicated family relationships? Congratulations on your newest book, Lisa . . . “Path Into Darkness” sounds fascinating and I’m looking forward to reading it. Complicated family relationships generally make for twisty plots and intriguing stories so I definitely enjoy reading those books, especially when they include revelations that are totally unexpected . . . .
Family relationships are some of the best to write about! I know exactly what you mean about your aunt reminding you of your dad. My father died way too young, at 63, but one of his sisters lived another twenty-five years. Every time I visited Aunt Jo in San Francisco I was reminded so much of Daddy. Can't wait to read the new book! The book sounds terrific, Lisa. Congratulations on the great reviews, including the recommendation from Deb's critically astute daughter! I love books that dig into complicated family dynamics--it's a theme we can all relate to. Family secrets are fascinating. Sometimes we're motivated to hide the most trivial things as if they were original sin, and sometimes parents train their children from birth to hide, deny, or ignore huge things that should be dragged out into the light of day to die of exposure. Hallie's most recent book, You'll Never Know Dear, is a great example, as is an oldie of Deb's, Mourn Not Your Dead. Of course the ongoing family dynamics of Ingrid's Fina Ludlow novels keep tension at the heart of the series, no matter what Fina's investigation du jour might be. I look forward to reading your take on the subject. Love your reflections on finding bits of your dad in his sister. I see that with my sisters, so many gestures, expressions, mannerisms that we share. And that thing about the same personal themes swirling back again and again in our writing - I've got that, too. Congratulations on the new book, "Path Into Darkness" sounds like a great read. This book sounds so great! Congratulations! And I have to tell you, the other day I saw picture of myself and I thought… Oh my gosh, this is my mother. Not that we looked exactly alike, but my entire posture was hers --the way I crossed my legs, and gestured with my hand. The tilt of my head. Completely mom. It was really disconcerting -- surprisingly so. Lordy, I see my mother every time I look in the mirror. I put on my sweater today, and my mother's arm came out the sleeve. This happens to me so often, although I also see my grandmother's hands and my father's nose. We are all made from the family soup. Oh yes. Erma. How I miss her humor! What a great Erma Bombeck quote! That's exactly it. I see more of my father's side, for sure, when I catch myself from a side reflection in a window or something. For a second, the jolt and then, yes, the disconcerting feeling. Congrats, Lisa! I enjoyed the first two books, so I can't wait for this one. Thanks, Mary! Hope you enjoy it! Lisa, I think that is so wonderful that you got a chance to be with your father for a few moments! My father was an only child so I never had that experience but I can easily see how it would be. Lately I find my self turning into my mother, not always in a way I like either. But a glance in the mirror - my grandmother! How can that be? Looking forward to reading your latest book! Congratulations, Lisa, on your new book. This is a series I've been meaning to try for a while, and I'm glad you've given me a reminder! I do like books with complicated family relationships. So many books explore romance or friendship, but not so many (probably especially in the mystery genre) that delve into the fascinating world of familial ones. I remember reading a couple of books in a series a few years back where the female detective's father had Alzheimer's. Pretty interesting! Congratulations Lisa. This novel sounds captivating and fascinating. Novels with friction and family relationships are memorable and unforgettable since families are always fraught with problems and trials and tribulations. I sometimes wonder what it would be like to be a member of a huge clan with five siblings and dozens of aunts/uncles, very close nit and leaving near each other. It's like imagining living in a foreign country. 3. Love authors with the skill to weave family relationships into crime stories. Can't wait to get my hands on Path into Darkness. Congratulations on its launch, Lisa! Your observations about your family mannerisms is so true and accurate since family traits are major. Congratulations and best wishes on your book which is meaningful since family relationships make stories come alive. Thanks, petite. We're not a close-nit family, to be honest, so I don't often get a chance to see the family mannerisms in action. I suppose that's why I got teary -- what a shock! Lisa, welcome to Jungle Reds. I enjoyed reading your guest post this morning. I remember that you commented on other posts once in a while. Were you one of the Debutante Ball bloggers several years ago? I looked and looked for your book then my library finally had a copy of your Kilmoon book. Yay! Interesting stories about your Aunts. Is your dad's family Irish? When I read your Kilmoon book and your character was named Merritt, I thought of Lake Merritt in Oakland. Reading Kilmoon, for some reason, I thought of the Jane Garfolo (sp?) movie about an American who arrives in Ireland at the same time they have a matchmaking festival in an Irish village. Can I ask if your books were made into a movie, is there an actress who you could see playing Merritt? I thought of Bernard Cribbins, a British character actor, as Liam. Looking forward to reading your new book! I often notice that the day a new book is profiled on JRW, I find the book at my local indie bookstore! Coincidence? The question of actors came up recently, and I landed on Rooney Mara for Merrit and Tom Hiddleston (is that right?) for my detective, Danny. I hadn't thought about Liam, actually -- Bernard Cribbens, good choice! Hope you find the book at your local indie! Hi Lisa, thanks! If I cannot find a copy of your new book at my local indie, then I will buy a copy at Bouchercon if your books are available? Oh, and hopefully we'll meet! Lisa, so glad you visited with your aunts and that you had those verklempt moments about your dad. How could you not? Time is precious with the generations that come before us. My father died earlier this year, and tomorrow is his birthday. I will bake a cake (wait, who am I kidding--I will buy a cake) to celebrate. Whether he's here or not, it's still his birthday, right? Best of luck with Path Into Darkness! I am looking forward to reading. Welcome Lisa, and yes, I love books about family dynamics, prefer them even. I happily anticipate reading PATH INTO DARKNESS. Lisa, I see my mother more and more often when I look in the mirror. Not always flattering, but it makes me miss her. I loved your story about your aunt. And I'd love to know, why Ireland? Where did that connection come from for you? Debs! The unflattering bits are the most disconcerting. :-) Like when I glance in the mirror and see the jowls that are just starting to appear -- ARGH! The Ireland connection comes from my dad's maternal side: the O'Briens. Grandma O'Brien was the one grandparent I never met, and she was the grandparent I took after, apparently. Spitting image, kind of thing, which made me curious about my Irish ancestry. Apparently, Granny was the prototypical Irish-Catholic matriarch -- such funny stories -- so that's what started it. Then I actually went to Ireland for the first time, sealing the deal! I love reading books with complicated family dynamics, which is no surprise given that those are the books I love to write! Congrats on your new release, Lisa! It sounds intriguing! In terms of family traits, I share the same mannerisms with one sister, in particular, and it's always alarming to find myself standing next to her in the kitchen in the exact same pose. Sometimes, we even respond to thinks verbally in the exact same way! Spooky! The families we are born into, the families we create--in every sense of the word--are woven into our lives. Even a mystery that doesn't delve into family relationships of the protagonist--that's still a statement about the character's ties/lack of with family. Powerful emotions, memories--always makes for fascinating reading. Congratulations on your newest book, Lisa! Hi Flora -- the families we create, that is so true too. I often feel that I'm closer to the families I've created than my actual family--which might be why I delve into family dynamics so much. A longing? A curiosity? Lisa, it's so great to see you here at Jungle Reds! You know that I love your County Clare series, and Path into Darkness is another favorite for me. You handle multiple family relationships brilliantly in your series, with this book being especially complex in that area. You were so smart to make that visit to your dad's family in Chicago, and it's wonderful how much of your dad you were able to take away from them. I also enjoy the posts on your FB page about you and your mother and your movie nights. I'd say that between your father and your mother, you turned out pretty special. Thanks, Kathy, that's so sweet of you to say. I'm actually due for another mom movie night this Friday evening. :-) So I expect I'll post another picture too. Cheers! Welcome, Lisa. I love that your series is set in Ireland and that the parent-child relationship is a theme you keep exploring. My dad passed last year, so I am in that head space, too. Looking forward to your series! Hi Jenn, I'm sorry for your loss. It's so hard. That particular head space does make for great potential storytelling, that's for sure. Family dynamics can be major drama! Good and bad. It is funny how we can suddenly see family traits. I saw a picture of my middle sister and the way she was standing and holding her arms was just like Grandma! I am looking forward to reading Path into Darkness so much. (I'm worried about Danny.) I won a copy from Dru's Musings a week or so ago and am eagerly waiting for it to arrive. Hi Pat, poor Danny! I put him through the grinder. I remember you won a copy through Dru, and I'm sending it out today, as a matter of fact! :-) Sorry for the little delay. Cheers! Hi everyone! I'm late, as I usually am anyhow because I'm on the west coast. But this morning I've been distracted by the huge fire raging in the Columbia Gorge nearby. It's awful and devastating and heartbreaking. But I'm here now, and will start replying! Oh dear, not the Gorge! Hope it is contained soon, with all the firefighters, live stock and gee everything safe from harm.. esp a good writer like you. I hope it's contained soon now too. Seems that the worst is over as far as how fast it's spreading, so that's good. Hi Joan! I think there's a revelation or two in PATH. :-) That's the fun of writing mystery, eh? Edith! Thanks! The nature aspect of family is fascinating, isn't it? After living their whole adults lives apart, my auntie and father were still so much alike ... mind blowing really. Hi Lisa, I enjoyed reading your post this morning on family dynamics. I didn't realize that being named for a family member, my Great Grandmother, meant I had to look and age like her. I did. I will be joining my sister in October, and will look for family traits. To our friend on the Treasure Island Coast, batten down. It looks like Irma is going to go up the Atlantic side based on the latest NOAA forecast. I am on the Gulf side. Best of luck to those in Irma's path! Hi Gigi -- secrets have lives of their own, don't they? They find a way to leak out of us in unhealthy ways like physical illness, and so on. Such great fodder for fiction! Thanks, Hallie! In your family it must especially interesting because you-all are in the public realm. The Ephron sisters -- is that a strange thing? Ever since I was tiny, people have known I was my mom's kid. Then there were people (when I was older) who thought I was her. My grandfather's younger brother looked, acted, and sounded just like him. It was so spooky to run into him after Gpa died. I am looking forward to this book. I really enjoyed the first two. Thanks, Ann! I have a half-brother from Mom that we only discovered way late in life, and when I saw him for the first time, it about took my breath away -- exactly like mom. That was pretty wild. It depends on how shaky I am feeling about my own family relationships. If I feel strong, it can be therapeutic. That's a good point. Novels can hit a little too close to home at times.